Whether it’s basking in history and tradition at one of Seoul’s five palaces, or emptying one’s wallet in some of the city’s most popular shopping districts, Seoul has a handful of tour buses serving both local and international tourists. Korea’s capital attracts more than 12 million tourists annually. Looking to offer visitors more variety and options, the city’s numerous tour bus lines include trolley buses, European-style double-decker buses and a panorama open-top bus. 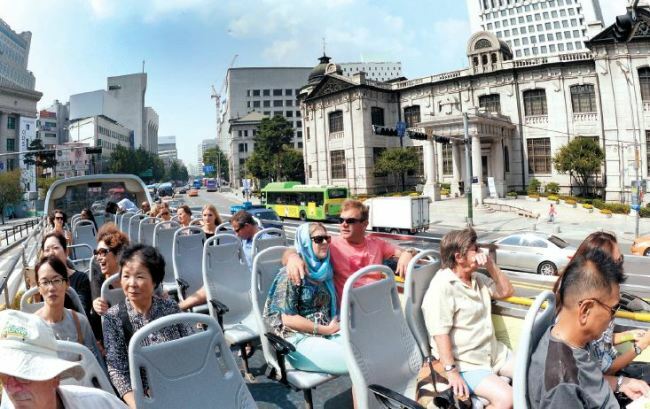 The Seoul City Tour Bus systems provides organized shuttle tours to nearly all of the city’s must-go hotspots including Gwanghwamun, Dongdaemun, Namdaemun, Myeongdong, Gyeongbokgung, Cheong Wa Dae and Insadong. Ticket prices range from 5,000 won ($4.4) to 15,000 won. And with the cost of a single ticket, one can spend all day hopping on and off the circular routes. For first-time or short-stay visitors, it is arguably one of the best ways to discover as much of the city in a day. For those travelers looking for a bit more romance, both the single and double-decker buses offer nighttime tours.